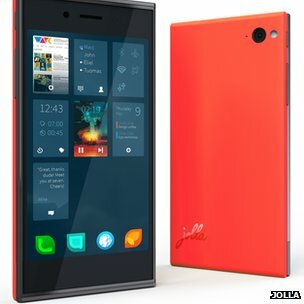 A company made up of former Nokia employees has shown off Jolla, a new smartphone with a custom operating system known as Sailfish. The software has been built from the remnants of MeeGo, a project abandoned by Nokia in 2011 in favour of adopting Windows Phone for its handsets. 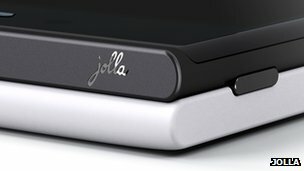 The Jolla phone – pronounced Yol-la – is due to be released by the end of the year, and will only be sold online. It will enter a market already heavily crowded with several operating systems. “For a couple of years we haven’t had anything really interesting in the mobile phone market,” said Antti Saarnio, chairman and co-founder of Jolla. The phone has a 4.5in screen, with an eight megapixel camera. It also supports 4G and is compatible with apps made for Google’s Android. The coloured back of the phone is interchangeable – and the operating system’s interface will change depending on what type of cover you have. These changes could include, for example, team colours for a football team. “You connect it to the phone, and the user interface reflects the players and colours of the team,” Mr Saarnio told the BBC. He would not confirm how exactly this feature works – but many speculate the use of near-field communication (NFC) technology. Mr Saarnio left Nokia in 2011, along with several other employees who had been working on a joint Nokia-IBM project to create a new mobile operating system to rival the likes of Apple’s iOS and Google Android. Nokia released one handset running the MeeGo software, the N9-00. Mr Saarnio felt it was not given enough of a chance to succeed. “The team really felt that this was one of the best phones in the market, even though it was quite under-marketed,” he said. Several of the team left the Finnish mobile giant to start their own company and remain working on MeeGo, which it has renamed Sailfish. Despite leaving the company, Mr Saarnio said he wished Nokia well – and that Jolla was open to letting them use Sailfish in future handsets. “We are actually quite open – we are offering this operating system for other smartphone makers to use.